Auto Body Repairs for all makes and models! If you need auto body work, stop by today. Being I-CAR Certified means that we take your family’s safety as seriously as you do. That’s why we’ve invested in training and have achieved Gold Class Status. That is the industry standard for training that means we know how to fix your vehicle right. Only 10% of repair shops meet these standards and we are one of them! We find hidden damage you don’t see and we know what needs to be fixed. Don’t take chances with anyone else. Come see us today! Our auto body repair specialists in San Jose take the time to ensure your vehicle is done right the first time and there aren’t a lot of other shops around that can claim the same. Trust us when we say, our team will show you a new level of quality and professionalism. We really set the bar high, and constantly strive for 100% customer satisfaction for each car that comes in for service. 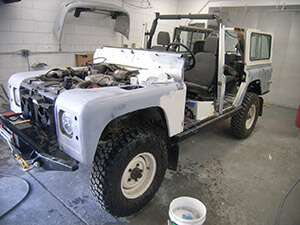 We work on all makes and models and advanced Jaguar and Land Rover services. Don’t choose your auto body and collision repair shop just based on prices. If you get a quote that’s too good to be true, it probably is. Some shops will cut corners just to get the job, but in the long run, you pay for what you get! We never use inferior parts or equipment when repairing your vehicle. At City Body, our technicians have ongoing training in all new vehicle technology to make the right decisions to safely repair your car, check for hidden damages others may miss, determine which parts can be repaired and which ones need to be replaced. City Body has been a staple of San Jose since 1946. With the most advanced knowledge and latest equipment in the automotive field, our I-CAR certified technicians are able to handle all auto body and collision repair tasks large and small. We will go through the appraisal, repair, and insurance process with you step-by-step until you feel comfortable with the entire process.